SKU: N/A. Tags: Buy Gummy Bear Edible, Buy marijuana edibles, cannabis edible, Gummy Bear Edible, marijuana edible, Marijuana Gummy Bears. 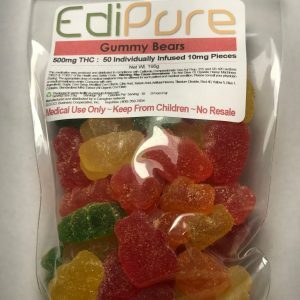 This is one of the most delicious marijuana edibles on the market, the Gummy Bear from Edi-pure contains 10mg of THC per Gummy Bear and the entire bag contains over 50 gummy bears. The Sweat and Sour Cannabis Gummy is a great choice for medicating and easily allows the user to dose, as each bear has 10mg of THC. How To Use Gummy Bear Cannabis Edible (Hybrid) – 500mg ? Edi-pure edibles are one of the top names in the industry, you can use these edibles to help control seizures, Fibromyalgia, appetite loss, migraine and most pains. Marijuana Gummy Bears popular with elderly and people with muscular and joint pain, as it helps sooth the pain. If smoking marijuana in it’s raw form isn’t for you, then enjoy marijuana edibles from PotValet in California today. Inactive Ingredients: Sugar (5g), Corn Syrup, Soybean Oil, Milk, Cocoa, Whey, Flavorings.